Just the right amount of tape to measure a 20-pound steelhead. A handy, convenient way to measure many different kinds of fish of all sizes. A 24" fish will weigh approximately 4-pounds (well kind of). Then for each additional inch in length add a pound. Girth of each fish will greatly influence the actual weight, and as you can see from the chart below, the average 24-inch steelhead might weigh more like 5-pounds. But, by the chart below an average 30-inch steelhead weighs pretty close to ten pounds. The inch per pound rule seems to hold fairly true up to the 34" fish weighing 14-pounds, if the fish are pre-spawn. 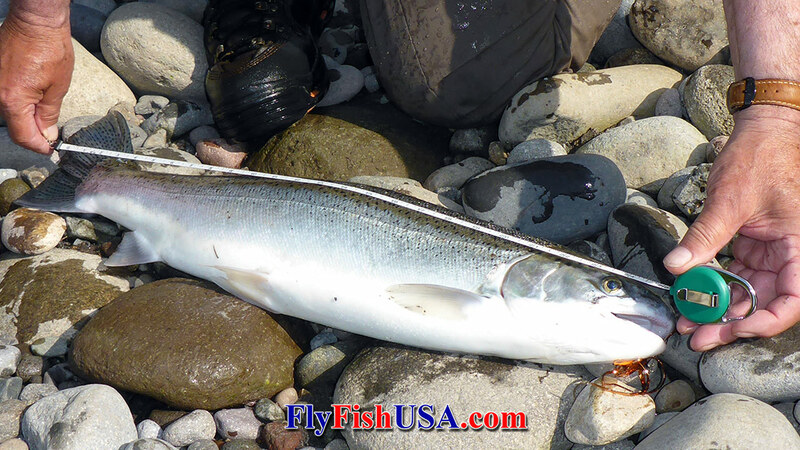 Steelhead lose weight fairly quickly after they enter fresh water. This same fish might weigh as little as 12-pounds after being away from the saltwater feeding grounds for a month. It will weigh even less after spawning. We have seen estimates that the average female steelhead might lose over 40% of her body weight while spawning, which would leave our 14-pound steelhead at a mere 8.4-pounds. In our local rivers the average hatchery steelhead is slimmer than the average wild steelhead of the same length, so probably weighs somewhat less. Below a hatchery steelhead is being measured and harvested. Please don't take fish that you are going to release out of the water, and never drag a wild steelhead up onto the beach. Trout, steelhead and salmon are fragile and can not live out of the water for more than a very few minutes. Take your pictures of wild game fish in a hurry and get them back into the water. 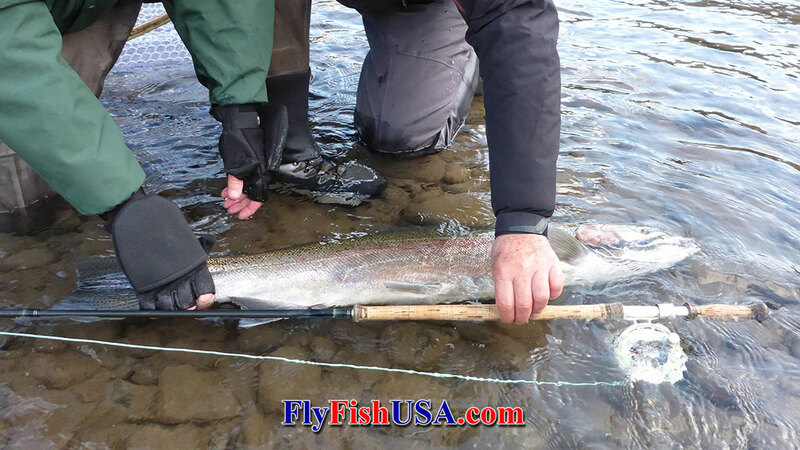 The steelhead below was measured with the rod and later the rod was measured. Our measurement came out to 39.5-inches (probably fairly accurate). But, there was no girth measurement, because we didn't have a tape. 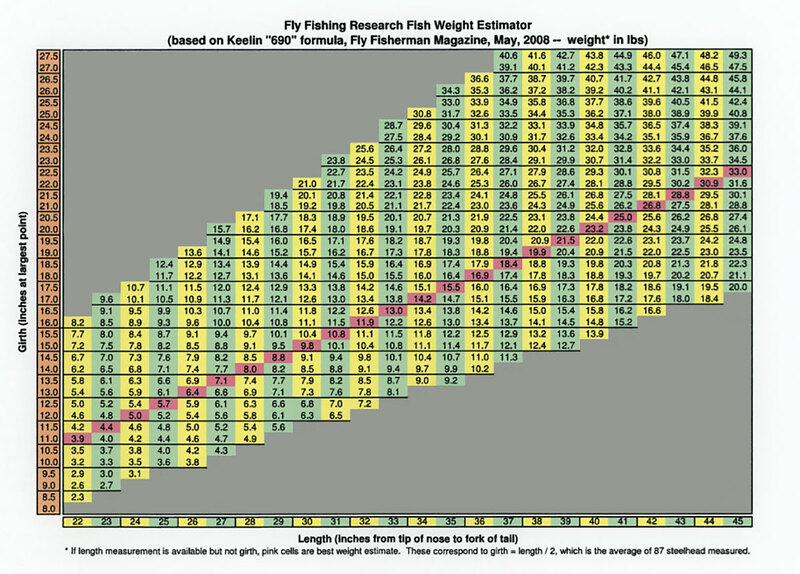 The chart above discloses that this fish might have weighed anywhere from 18 to 24-pounds. We judged it at 20-pounds. If I would have had a Tape Measure Retractor, we would have known for sure. This fish was pre-spawn, but fairly colored and was probably a repeat spawner that had not lost all of his coloration from the previous year.